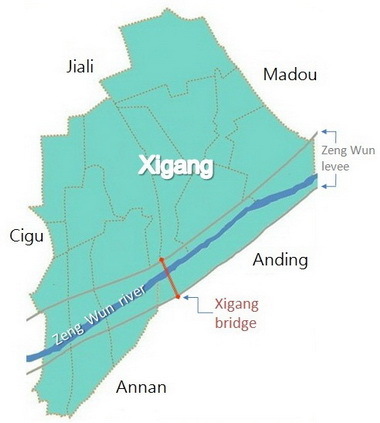 Xigang is a small town across ZengWun river, surrounded by Madou、Jiali、Cigu、 Anding and Annan. The total acreage is approximately 33.7 square kilometer with population over 25000. It comprises 12 villages、6 elementary schools、2 high schools、2 churches and more than 50 shrines and temples. Xigang used to be a small harbor nearby Taijiang lagoon. In 1823, a destructive flood swept ZengWun basin, changed over the landform of entire Taijiang. Subsequently the lagoon became wetland, then after 50 years of reclamation, the whole wetland was transformed into farmland and fish ponds. Xigang was well known for the religious festival every 3 years. But apart from festival, there're some other scenes worth your visit. If you came to Xigang for the first time, a bike touring for one day will be recommended. Basically, most villages in Xigang were built along the bank of ZengWun river. So if you ride a bike atop path of ZengWun levee, not only you can view every village, but also all other tall buildings in downtown Tainan from long distance. Besides, there're altogether 12 villages in Xigang, each village has its own principal temple in the central, dedicated to diverse divinities. So you can take your chance to visit every temple in same day, to enjoy the beauty of architecture and learn the story behind each temple.